Yesterday I received a comment on one of my blog posts regarding the Luxembourg Palace issues designed and engraved by Albert Decaris. The reader asked me to add an image of the 10f value to my 1948 reissues blog so he could compare the different values against each other (click HERE). I was happy to help him out, and I have to admit that even though I did a blog for the 10f and a separate blog for the reissues, I never thought to compare the different printings. I just assumed they were from the same die with simply a value change. So I took out my 10f 1946 stamp and my 12 and 15f 1948 stamps and laid them out side by side. I was immediately surprised at three glaring differences that are so obvious I can't believe I had missed them! I guess sometimes you don't see what's right in front of you. And the more I looked the more differences I found. This got me to thinking: are the reissues totally different engravings? Below is the top portion of the 10f and 15f together for comparison. I have circled the three main differences. Note that the 12f is the same as the 15f so there was no need to add it here. The biggest difference is the name, which in turn, contributes to the other two changes. 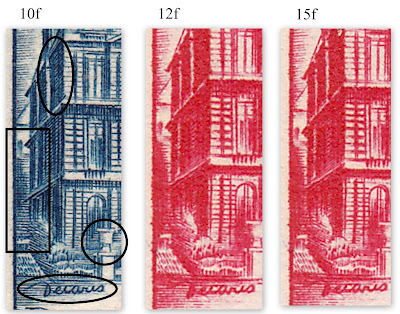 The original 10f value has only the initials "RF", whereas the 15f value has the full name "France". This change completely alters the shading at the top middle and the top right corner to the point where in the corner it is non-existent in the reissue. I found some more differences between the original and the reissues. 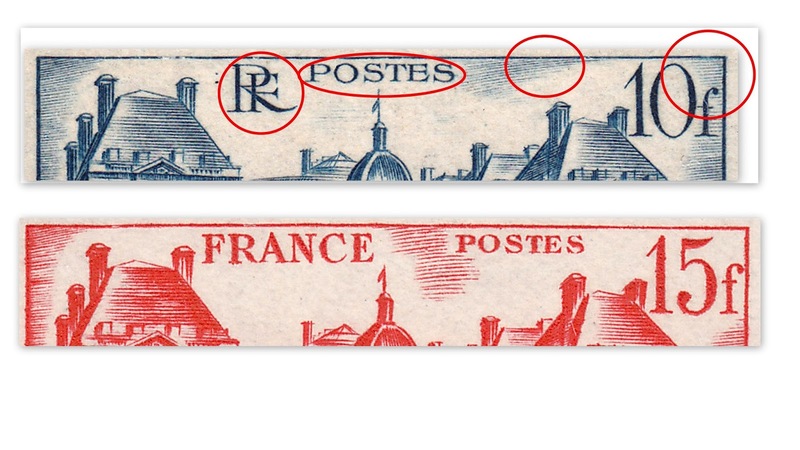 But are these differences due to engraving variances or are they merely a result of colour choice? Both the 1948 reissue stamps were printed in red, which make the image look rather heavy, blotting out some fine details. I have again circled some of the differences in fine detail that I found between the issues. 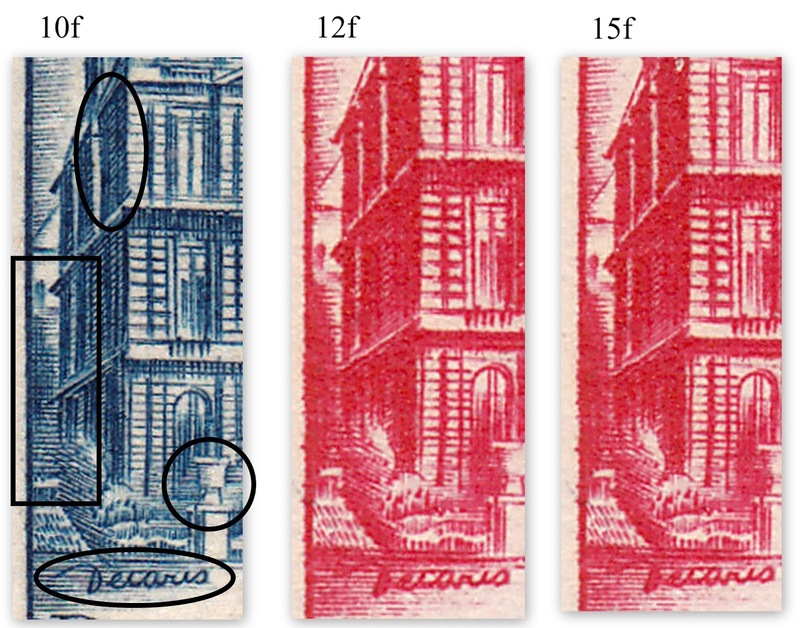 Firstly, if we compare the detail I have highlighted within the rectangle of the 10f stamp with the two other values, there is a distinct difference in the clarity of detail. The red seems to have obscured the background somewhat. So I ask again: is this an engraving difference or merely a colour difference? Not sure? Take a look at the pot on the 10f value. The outline is far better than the reissues. The same goes for the signature; the 10f is by far the clearest of the three. And if you look closely you will notice that the "I' is not dotted in the original 10f, but it is dotted in the reissues. 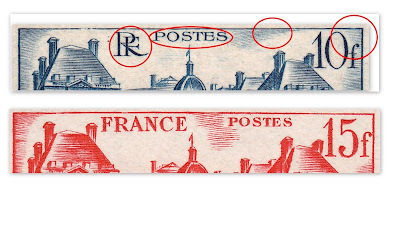 To conclude, I initially believed that the reissues of this stamp were from the same die with the value changed, but all the differences suggests to me they were different engravings. I could be totally wrong here, so if anyone has any additional information on the printing of these issues I'd love to hear from you. Thank you for sending me the link. Your information really helps to clarify things for me. I hope you continue to enjoy my blog.